Joey campaigns to Caleb I can keep you safe for 3 weeks & volunteer to be a havenot..
Big Brother Spoilers > Big Brother > Big Brother 16 > Joey campaigns to Caleb I can keep you safe for 3 weeks & volunteer to be a havenot..
12:20pm All the house guests are on a backyard lock down. Cody and Christine are laying out in the hammock talking about past seasons of Big Brother. Amber joins them. Christine asks if its okay to talk about their period. Cody says he doesn’t care. He says you guys are going to cycle up soon aren’t you. Christine says no me, I’m on birth control. Cody says that his ex-girlfriend never got her period which at first scared him. Over by the lounger – Devin, Caleb and Frankie talk about music. Frankie starts talking about his sister moving out to LA. Devin asks why she moved so far away? Frankie says it’s complicated, there were like 50 reasons. He tells her she’s in university for music. Devin tells Frankie that he should do a late night talk show. Frankie says that’s a great idea! I would love that. Devin says I think you could do anything. You’re so talented. Big Brother ends the lock down. Devin starts talking about how hard it must be for Derrick to have his daughter in the hospital right now. Devin talks about being young and his mom struggling to feed them. Saying that she would come home with 1 or 2 hamburgers off the $1 menu. Caleb says he’s had highs and lows too. To the point that at one time he had to eat cold ravioli out of a can. Caleb comments that his Dad has a 9 bedroom million dollar home in Texas. Devin calls Nicole over to ask her questions about nursing school. 12:40pm Christine in a compromising photo – She kisses Frankie’s stomach. @DawgsBigBrother i'll use that as collateral next time I want to buy something goofy. "christine if I cant buy this, ill release this photo"
In the havenot room – Christine talks to Joey. Joey says that if I do have your vote please help me change that within the group. Christine says I don’t know what the house is doing yet. It’s too early to go against the house. Joey asks what do I offer people you know? Christine says you could offer like a 3 week deal.. you don’t have to keep your word. Christine says that she will talk to people. I think this week people were going to get out the weak players but I don’t know what people are doing now. They leave the room and Joey talks to Caleb in the living room. She tells him that she really wants to stay and that she can offer him safety. She says I know its hard because you haven’t seen a competition with me competing. Caleb says that he can talk to people but that people can say one thing and do something else in the diary room. Joey says I can help out people a lot more than Paola. Joey says I can volunteer to be a havenot again too. I did it once and will do it again. Caleb says I can share that with people, will it matter. I don’t know. Caleb leaves and Joey talks to Hayden. He tells her that she should be having that conversation with everyone. I am a better competitor, you give me the chance to stay in the house – I will compete to keep you safe. Promise them that you will fight for them if you’re still in this house.Joey says okay I am promising you right now that I will fight to keep you safe for 3 weeks. I am a better competitor than she is and I want to stay in this house. 1:10pm Out in the backyard Victoria and Nicole are suntanning. 1:15pm Joey heads to the hive room and campaigns to Zach. She tells him that if he keeps her she will fight to keep him safe. I am a stronger competitor than Paola who can’t offer that. Zach tells her that at this point he is voting with the house. You need to convince Devin and Caleb to keep you. Devin is very easily swayed. He is bipolar. One minute he hates you and then the next he loves you. Work on convincing them. I am going to vote with the house because otherwise it puts a target on my back. Joey tells him that there is more that she can offer too but that she cant say right now (Team America?). Zach says as of right now I think its you going home but that’s just because of what happened the last few days. I would rather you stay than Pow. She brings nothing. Why would I want her here. Why is she staying when she’s the weakest player in the house. In the backyard – Devin tells Donny that he has his back and will fight for him. 1:45pm In the bathroom – Caleb tells Zach about his conversation with Amber last night when he told her how he feels about her. He says that Ambers was response was that she was shocked and didn’t see it coming. Caleb says that he told Hayden and his response was – Seed is planted! Caleb says he knows its a lie because Hayden said she made a comment about her saying we could go on a date when we get out. Caleb says that she denied she ever said it. Caleb says so I went to Hayden and told him I hate it when people lie to me. He told me its the truth and he’ll see it on tape when we get out. 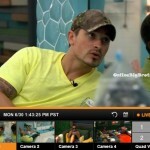 Caleb says I think Amber was just didn’t want it out there because she was all mic’d up. Amber gets called to the diary room. Caleb says I know what that’s about. Zach says yeah she’s perfect for you. I remember the first day when you said you’re in love! Caleb says I wish I could sneak in there and listen to what she has to say.. Zach leaves and Paolo joins Caleb. He then tells her all about his conversation with Amber last night. Caleb says that Amber didn’t really give him an answer. (The conversation made Amber super awkward and tried to get out of there as fast as she could. Amber denied looking at him any way and said she doesn’t want anything other than to get to know people in the house.) Paola tells Caleb that she wishes he had waited another day like she said. Caleb says he doesn’t think it would have made a difference. 1:55pm – 2:15pm Out in the backyard – Joey talks to Devin and tells him that she knows he has a lot of pull in the house. Devin says I don’t know about that, I’ve been trying to stay low lately. He tells her that she’s got is vote but that he’s worried he’ll be the only vote and people will question who it was. Joey says I’ve talked to people and they’re afraid to go against you and Caleb because you guys are the strongest competitors. Devin says I don’t know why. Devin says that Paolo came to me to ask me for my vote but I told her I haven’t made my decision yet. Joey says people just want to know that if they vote for me, they won’t be targeted. 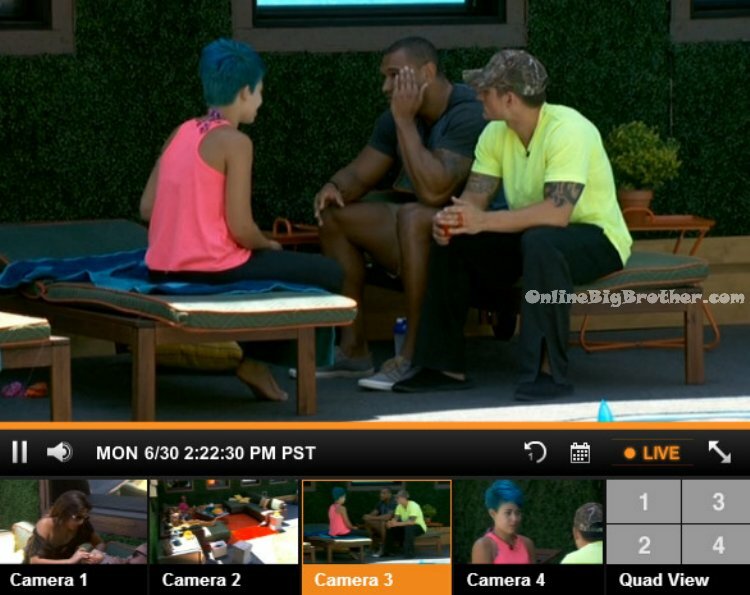 2:20pm – 2:35pm Joey campaigns to Devin and Caleb telling them again that she will offer them 3 weeks of safety of not put them up and volunteer as a havenot again. She says that she will do everything in her power to keep them safe if they keep her safe this week. Caleb says I don’t have a vote, only Devin does. Joey says but you have a lot of pull. I have something to give you guys whereas Paola doesn’t. She tells them she can promise them her loyalty. Joey says I’m entertaining and I will not pull anything again. I’m a better competitor. She says I’ve got the brains and the muscles, which is very rare. If you guys need a Have Not, I’ll take it for you. Devin says you don’t have to sell me any more. You’ve got my vote. Joey says I’m way more valuable to your game that Paola is. Caleb says I’ll do my part where I can. Devin says some coaching advice for you would be go up to everyone and really work on them. He tells her to give them everything you’ve got but Don’t oversell yourself. He tells her to do it quietly and not in front of everyone. Caleb says just be yourself. Devin gets up and leaves. Joey continues to work on Caleb. 2:40pm In the bathroom – Brittany fixes Paola’s hair. Paola says Oh boobies in my face.. motorboat. In the bathroom – Devin and Amber talk to Victoria. Devin tells her that Joey talked to him trying to get his vote. He says that he told her he doesn’t know what to do, having to choose between two people. Victoria says that she doesn’t know what she is doing yet and doesn’t want to says so that she doesn’t have to go back on her word. Devin says whatever we do we just need to come to a house decision because I don’t want to be the odd man out. Zach joins them. Devin says if the house wants you got to go then you go. In the living room – Caleb tells Paola that Amber wants you here so I don’t want to go against that because I don’t want her upset that her friend is gone. Caleb tells her to lay low and relax. Someone is going to paint a target on their back. There’s nothing on you and its all on her. The cameras switch to the bathroom again with Devin telling Brittany and Amber that he needs to talk to Joey again. I just can’t promise her anything I don’t want a target on my back. 3pm In the storage room – Victoria is making fun of Devin coming up to her asking her which way he’s voting. She imitates him says I don’t want to be the odd man out. Brittany talks to Amber about how she’s annoyed that Joey keeps bringing up her name. Brittany says she doesn’t want her name brought up in conversations. She says that everyone thinks her and I are close but we’re not. It puts a target on my back and I don’t want that. 3:10pm In the kitchen – Caleb tells Frankie that he is thinking of telling Amber that he is sorry for making her uncomfortable last night. Frankie agrees that’s a good idea. Yes, it seems that production has – once again – shot itself in the foot…will they ever learn? I don’t think there are going to be tasks like how to vote or who to nominate, because it is going to be a group team. I think they are going to be tasked with getting people to do things, like BBCan’s Marsha the Moose, gets Tallah to put on a talk show for an hour and get others to participate. Or BBCan2, Jon and Alison are set up to take a drink, then go out and try to act sober. then back for another, then out, then back for a 3rd, and out, and 4th, etc. The others aren’t supposed to notice that they are drunk. If they succeed, everyone gets a treat. In the AP, tho if they win, they get $5000 each. But if she has not told her that means she is not playing smart. Knowing that there`s a guys alliance in the house, she should have told not only Nicole but some of the girls also. I don’t know Kyle, I think Devin is so unstable right now that it might be great fun, and probably not all that hard, to bait him into an explosion or two. It likely wouldn’t be all that hard to do it without getting your hands dirty because he seems so unstable and anything you do to make him go off would probably be construed as innocent enough by the rest of your housemates. I think the more drama you can safely cause this early in the game while staying beneath the radar yourself, the better it is for your game in the long run. You know, just wind bi-polar Devin up then get out of the way and watch the fun happen. Once again I have control – kind of wish I didn’t – shades of last year – although it is early. who are we voting to evict? I don’t want to go against you. It’s early to go against The House. Guys, I wonder if production would tell Frankie and Zach about the whole Zankie craze? It’s pretty big online. HaHa! Have you seen “Zankie Mountain” on YouT…? Pretty hilarious! I had iffy feelings about Zach in the beginning, but now I think he’s alright…Zach seems comfortable with who he is and like the rest of the guys, seems pretty open minded also. Caleb surprised me also…since this group confesses everything, I’m sure Caleb will bring up his IG comments soon. I am not feeling bad at all for Joey, only because she screw the grills alliance, so because of that she gotta go. Devin actually said exactly what you said in a conversation a few days in. He admitted he was on steroids and that he had been drinking a lot and management asked him to go to rehab (didn’t say if it was for steroids or alcohol) and on the third week of rehab the team “released” him from his contract. I thought I saw it here or on Joker’s but not sure where now. Joey… i’m sorry, I think everyone made up their minds to send you packin’, You have a few days to do some serious digging and damage. Avoid Dumbo Devin please!! He’s the sinking ship of the season. WHAT!?!? Too funny…what is with these players just giving themselves away and confessing everything!?!? HaHa…that is too funny…Joey! Joey!! Joey!!! I wonder why she told Hayden, of all people. Looks like she’s not telling any of the Bomb Squad so far, just alluding to it and saying she can’t tell them everything right now. What did Joey do exactly? All I I know is she is hated by most of the house. She told the group that she tried to start an all girl alliance at the beginning of the show with Paola, Amber, & Nicole. loling at Zach’s description of Devin and telling her to go talk to him again, and then it actually working. Donny tells Cody if he was at home watching he would be pulling for him and Nicole.